Aboriginal legend holds that the sun itself began its life as an Emu egg hurled high into the night sky. For the native people of Australia the Emu has always been a sacred bird. Looked upon as the core of their existence, the Emu provided them with food, clothing, shelter and spiritual sustenance. Since those times, the native Australians have utilized Emu Oil for its healing, soothing and moisturizing properties. The ancient wisdom of Emu Oil was used to treat a wide variety of skin conditions and muscle and joint pain. Now the ancient wisdom of Emu Oil is being discovered by modern medical science. Emu Oil now offers modern man all the same benefits enjoyed for centuries by the Aborigines. Research has shown that Emu Oil is made up of mostly mono and poly unsaturated fatty acids which are important for a healthy skin and body with high levels of linolenic acid known to ease joint and muscle pain and oleic acid which produces an anti-inflammatory effect. Combine these properties with Emu Oils all natural non-irritating unique ability to penetrate deep into the skin, absorb quickly, soothe and moisturize and you can see why scientist the world over are exploring the tremendous potential of Emu Oil. Reliable research has been and continues to be done to document and support the claims that users of Emu Oil have been making for years. Science is proving Emu Oil to be a modern miracle for its ability to enhance the vitality of normal skin while therapeutically healing dry, chapped, damaged skin and for the relief of pain and inflammation of injured tissues and joints. 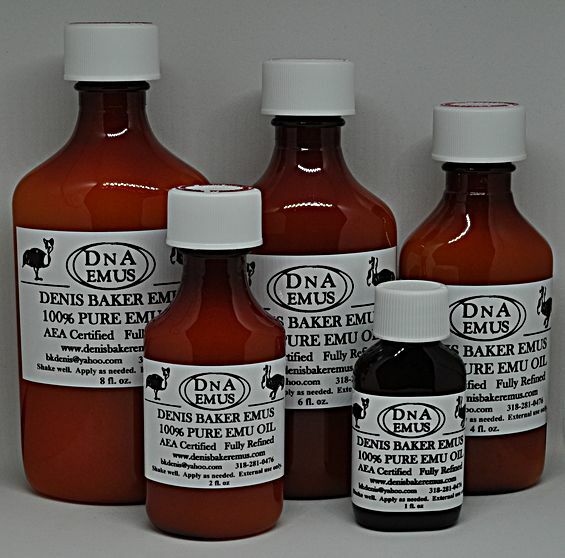 Of all the natural products available to the consumer today, none can boast the versatility and benefits of Emu Oil. The potential of this truly amazing oil is virtually untapped at this time. Today Emu Oil can be found from the medicine cabinet at home to the professional sports training room. Emu Oil truly is a medicine cabinet in a bottle. An ancient wisdom for modern time. A few drops of oil rubbed into the affected area is all it takes. Take it with you wherever you go. A little goes a long way. Join the millions of people around the world who are discovering for themselves what the ancient Aborigines have know since the dawn of time that with Emu Oil - Life Just Got Better!